Writing video closed captions can take a significant amount of skill. Professional caption writers must be fast, accurate typists with a broad vocabulary. They should also be intuitive enough to accurately describe sound effects and other useful information. However the intricacies involved in creating high quality closed captions extend much further than this. Especially when it comes to broadcast, caption writers need to follow a vast number of guidelines. These can cover verbatim styles, colours, placement, font size, safe areas, alignments, character limits, read rates and more. For this reason, caption writers require a high level of technical knowledge. These guidelines are not only vast and expansive, but they are also constantly changed and updated. Modern caption guidelines slowly supersede legacy specifications. Consider the current BBC Subtitle Guidelines. The BBC closed captioning guide for EBU-TT and EBU-TT-D formats includes over 25,000 words. This equates to over 100 pages of documentation. Oftentimes, people use the words ‘subtitles’ and ‘closed captions’ interchangeably. However, there are many differences between the two forms of onscreen text. Subtitles only include dialogue but in contrast, closed captions for deaf and hard of hearing viewer contain significantly more information. Nowadays, video content is distributed via more channels than ever before. Video platforms now include cinema, television, tablets, smartphones and many more… Technological developments have meant more compatible caption formats have had to develop over time. In addition, viewers expectations are changing in terms of what closed captions should include. Distributors are slowly phasing out legacy styles in favour of a more universal, modern approach to captioning. Let’s look at some of the fundamental changes taking place. Ellipses were often used in legacy subtitles, to segment sentences broken up between subtitles. The modern standpoint tends to be more towards segmenting closed captions sensibly, splitting at commas, full stops or dashes. Modern guidelines often suggest avoiding splitting nouns and articles, nouns and adjectives, first and last names, verbs from subject pronouns. This all contributes to creating a more natural flow of text. For deaf and hard of hearing viewers, it can be hard to figure out who is talking if they’re not onscreen. For this reason, often speaker identification becomes necessary. Legacy styles included placing captions to the left or right, directly under speakers. The aim here was to reflect where the sound was coming from. However, this technique is slowly fading out. Modern captions steer towards using specific labels and colours to identify speakers, (usually yellow for a narrator). When there are two speakers within one subtitle, standard subtitles use a dash before each piece of dialogue. This is in the true legacy style and works great for single colour captions and subtitles. However, the increasing use of colour in closed captions is slowly rendering this technique obsolete. The growing popularity of online video content has meant an increased need for closed captions. Many video closed captions users had complained about the inconsistency, and lack of availability of captioned content. 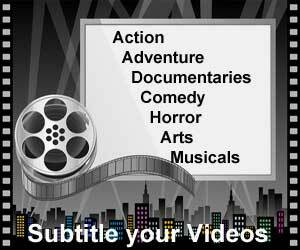 Different video platforms require different subtitle formats. Legacy styles have centred around broadcast video and are typically not compatible with online video distribution. Over the years, compatibility issues have led to changes in the legacy closed caption formats. Broadcast formats such as STL and CAP are rapidly being replaced with formats compatible with both online and broadcast. These include TTML, EBU-TT-D and DFXP. As you can see from this article, the task of writing video closed captions is constantly changing as technologies develop. If you would like to see some of our closed caption formatting we use take a look at our video closed captions formatting page to get a better understanding. However if you would like to get a quote for any of our services please refer to our quote page.